I thought I’d provide some notes on the steps I took when I initially decided to try to find out if my friends cold case is being given adequate attention. So if there’s anyone out there who’s interested is trying to gather information about a friend or family member who is a cold case I’m hoping this might be helpful to you. I first tried to gather as much information as I could based on what’s available through the public information act. And that’s not to say that I’ve completely researched what constitutes public information. But I was able to gather a few bits with very minimal research. I started with my friend’s death certificate which was available for free online. From there, after pinning down the date of her death, I was able to search the newspaper records in the public library to gather details about her murder. I then contacted the San Francisco Police Department. Chances are very little information is going to be made available if the case is open. Basically my objective was to let law-enforcement know that there was somebody that was willing to advocate for the victim. So although the police department may not be able to provide any details of the crime, it is helpful to touch bases with them so they can reassure you they are doing whatever they can. I tried my best to have prepared questions, to keep my conversations with them as brief as possible to be respectful of their time and let them know that I was grateful for their efforts. 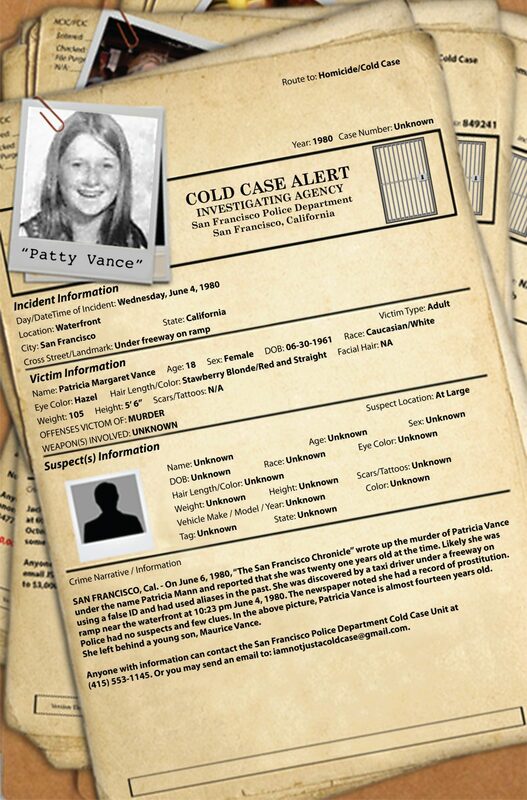 More on the subject of how to research a friend or family member’s cold case on my next post.